The Meantime Brewing Company's commitment to creating great beer has seen it make the largest investment in craft brewing in London since 1930. The team has built a state of the art brewery in Greenwich dedicated to giving their beer the time it needs to come into its own, however long that time may be. They have also established a visitor centre and a bar and needed a flooring partner for all aspects of the project. 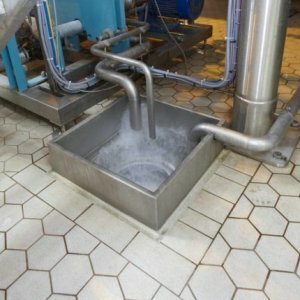 Kemtile was asked to recommend suitable flooring solutions for the craft brewery itself taking into consideration hygiene, cleanability and non-slip requirements. They were also asked to think about a decorative system for the visitor centre and bar areas to provide people on brewery tours with a safe and stylish environment in which to enjoy the experience and the beer. 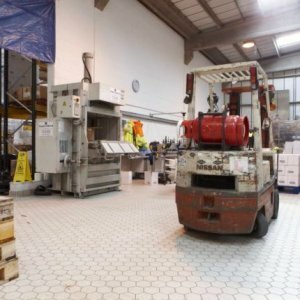 Kemtile installed 10,000 square metres of Kagetec GFK tiling which utilises a plastic mesh and epoxy bonding agent beneath the tiles to provide maximum durability in heavy impact areas. Kemtile also used Ucrete and then further decorative tiling using Kagetec AR in the areas open to the public. Over the past four years at the brewery, Kemtile has installed 450 square metres of Kagetec BS, 570 square metres of Kagetec AR, and 250 square metres of BASF Mastertop heavy duty polyurethane flooring. Alastair Hook,Brewmaster and Founder of Meantime Brewery, London, said: "Your boys did a hell of a job here. They were a credit to your company and I even had the German brewery installation company, Rolec, telling me they had never seen an English crew working harder than them. Being ahead of time and delivering on all your promises and more is a rarity for most companies nowadays. The floors look fantastic."